Last day I downloaded Windows 7 operating system form Microsoft using direct links. It contained a set of file formats like .box and all that are to be extracted to a set of setup files counting to around 2.5GB. Since there are lot of files it’s very difficult to transfer them though internet, or to create bootable DVD. One option is to pack all those files to single archive format like ISO. The advantage of .ISO is that it’s supported by almost all CD and DVD writing software, and we can make it a single bootable disc. We earlier covered freeware and shareware CD and DVD writing software for Windows. But most of them are not able to create .ISO images from a set of files. Then we came across a Windows utility called UltraISO that can convert, extract, create edit or update iso and other file formats. Use Ultra ISO to create ISO image from files. Burn files to CD and DVD. Only around 3B in size. convert ISO image to BIN, NERO(.NRG), .IMG, .CCD (Clone CD), MDF (Alcohol ) and others. 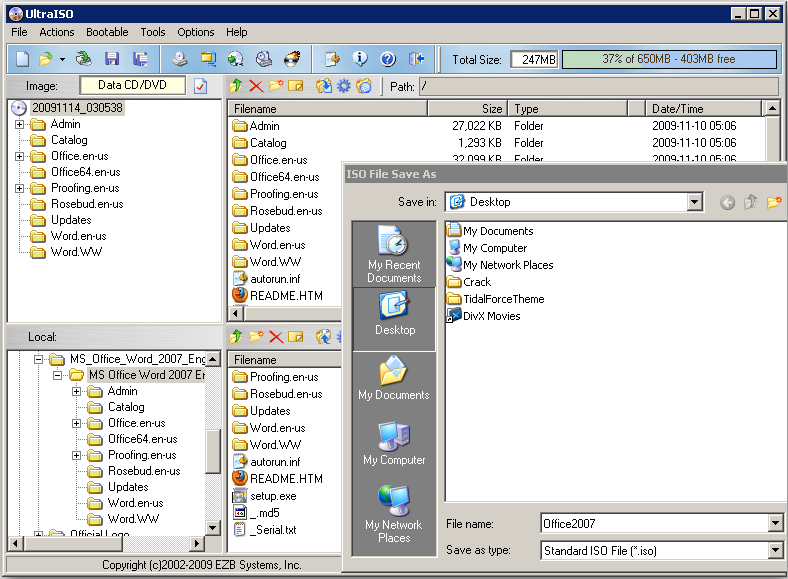 Extract edit files in ISO files. 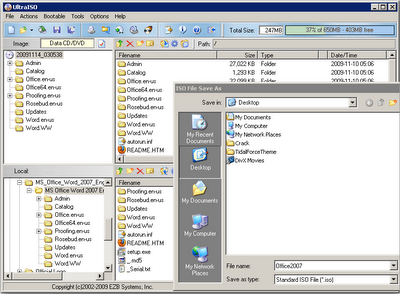 As shown above from the left bottom side, select the folder of files that are to be converted into ISO images. Here I am converting Office 2007 files to a single CD image. Drag all files from the right bottom section to top section. Now from File option, select to save as ISO. You can try UltraISO for a period of 30 days after which you will need to purchase it for USD 29.9.